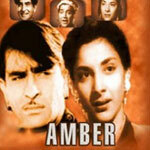 "Ambar" is a 1952 hindi film which has Nargis, Raj Kapoor, Agha, Bipin Gupta and Ramesh Sinha in lead roles. We have 2 songs lyrics and one video song of Ambar. Ghulam Mohammad has composed its music. Lata Mangeshkar, Shamshad Begum and Zohrabai Ambalewali have sung these songs while Shakeel Badayuni has penned its lyrics.